Is there an Afterlife after all? This was the question which kept kept coming on to my mind as I read the story. Ed starts off on a futuristic note when he portrays shortage of food throughout the world. He creates an organization which controls ration supply. Trust me, this situation does appear to be possible, since the rate at which agricultural produce is reducing is alarming. The concent is very good in terms of the storyline however, I found there was something amiss throughout. There were a few elements whose presence didnt add much to the storyline, like the rendezvous between the three clairvoyants abd Jack. Also, there is no stark contrast between the protagonist and the antagonist. It means that I couldn't make myself love to love the hero and love to hate the anti hero. Afterlife, or life after death, is always believed to be Heaven or Hell. This belief is common to all religions across the world. However, though the story did incorporate this but I felt, that Ed could have added a bit more of inter- faith religious beliefs to make the story's concept stand out. 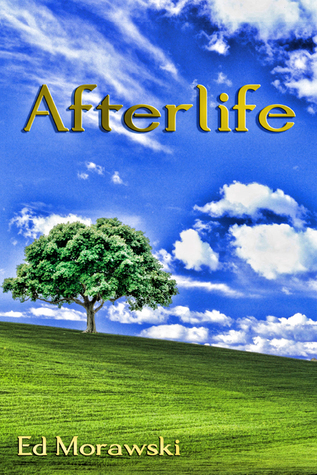 The story deserves 5 stars for a very refreshing concept, but for me, the treatment and weak characterization disappointed me a bit.To come back to my question at the beginning of this review, Afterlife is a hoax, a tool to compel people to willingly commit suicide so as to ensure availability of food in larger quantity. I hope, in case the situation of food shortage does exist, the issue is dealt with more sensibly and not by suicide compulsion. To sum up, the story is interesting but wish it could have add a wee bit more of descriptions. P.S- I received a free copy in exchange of an honest review from Booklover Catlady Publicity. Thank you Maxine.